The inaugural season of the Home Energy Challenge has officially wrapped up! And what a season it was. Six months ago, we kicked off HEC season one with a goal of enlisting 100 households and saving 100 tons of CO2 by February 2019. And we did it... and then some! The overall goal of the Home Energy Challenge is to help local residents discover and implement ways they can save energy and money. It’s a FUN, social, and personal way to empower households to do something. The HEC website offers a “menu” of 65 actions that participants can choose from to reduce their carbon footprint. Actions include everything from offsetting air travel and signing up for a home energy check-up, to installing programmable thermostats and solar panels and taking shorter showers. Whether you’re someone who has “been there and done that” or someone trying to make a difference with a tiny budget… there is something for everyone. Throughout the season, we offered extra tips and insights that homeowners (and renters!) could use to further reduce their environmental impact. On the blog, we shared “6 Simple Actions to Increase Your Home Energy Savings,” “3 Reasons Why an Electric Vehicle Should Be on Your Wish List This Year,” “Tips for Staying Green While Traveling,” and more news-you-can-use to green your life and household. To cap off our success, at the end of February, we gathered for a HEC Community Celebration at Three Notch’d Brewing. 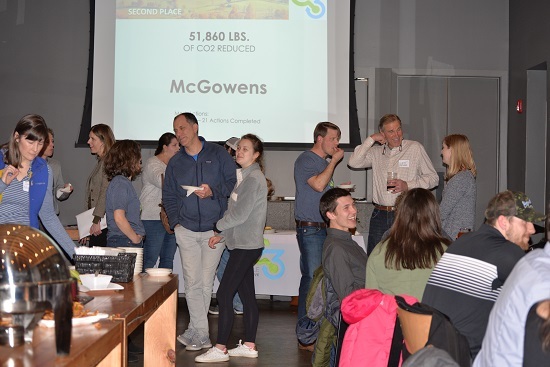 We had a blast celebrating our achievements and all of the ways our community came together to reduce its collective carbon impact. Thanks again to our fabulous community supporters who donated raffle prizes, including Shenandoah Joe, Trader Joe's, The Natural Garden, MarieBette Café and Bakery, Rivanna River Company, and Three Notch'd Brewing Company. And thanks again to all of our HEC participants who took action in season one! In the meantime, season two Home Energy Challenge teams have begun to take action — 13 household teams have been formed and are committing to doing their part! HEC Season Three: While we are now in HEC season two, we’re already looking ahead to season three! Recruitment for the third season starts in September 2019. Interested in joining the Challenge this fall? Email claire@cvilleclimate.org to learn more! Fashion Footprints: Whether you’re a part of the Home Energy Challenge or not, we’d love to help you learn practical ways to reduce your carbon footprint in your everyday life. On March 27 at The Haven in downtown Charlottesville, join us for “Fashion Footprints,” a clothing exchange to highlight the carbon intensity of manufacturing new clothes and to promote buying pre-loved garments! The event is FREE when you donate clothes to swap, or pay $5 to just come shop. Do you have gently-used clothes that you want to donate? Drop them off at our office (200 Garrett Street, Suite H) March 18-22 between the hours of 12-6PM! Event details. Climate Action Planning: Finally, what we've all been waiting for! Right in the midst of season two of the Home Energy Challenge, the City and County are engaging in climate action planning and want to hear from community members like you! Visit our “City and County Climate Action Planning” webpage for the latest on how you can get involved locally.